The kosher link up for this month is cocktails (see below!) I was excited when I heard that this would be the theme as I do enjoy a good cocktail! 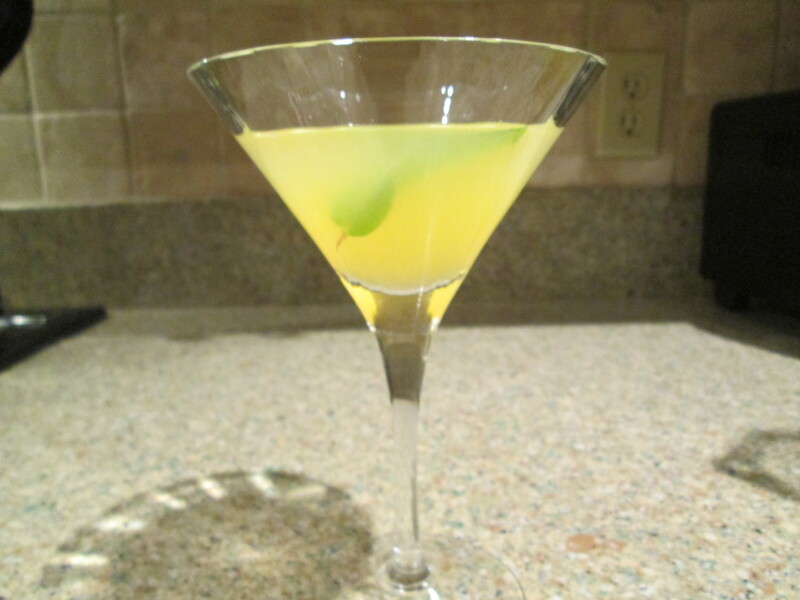 I then realized that I have never posted a drink recipe on this blog. Well, it is high time that I do so! I picked this martini because it was the first cocktail that I created on my own and it is delicious! This recipe came about as many of my recipes do – totally on the fly. I was having my sister and brother-in-law over for dinner. I had prepared a fabulous meal and felt that I needed to serve a fabulous cocktail. I had just picked up some meyer lemons from the store so I had them on hand, and I always have a bottle of vodka in my freezer 🙂 I put the two together and it was perfection – the the perfect balance of tart and sweet and very refreshing! I love meyer lemons. I only discovered them a few years ago from watching cooking shows (a favorite pass time before having kids!) I had never noticed them in the store, but came upon them one day and decided to give them a try. I use them for drinks, salad dressings, with fish and chicken. 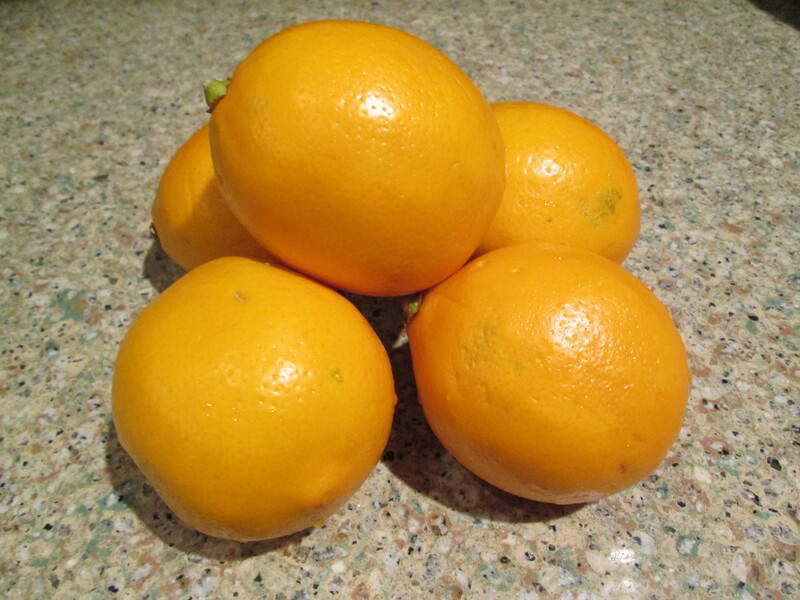 I describe them as a cross between a tangerine and a lemon. 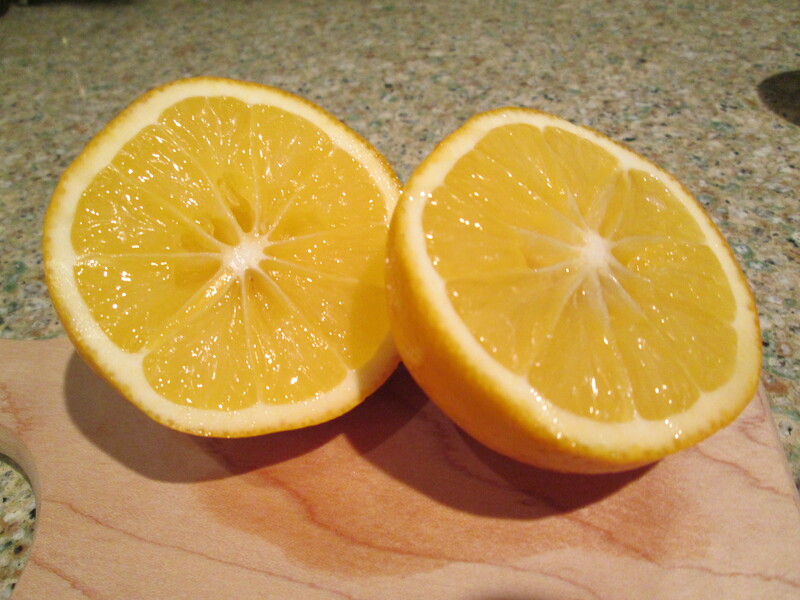 They are shaped like a lemon, but are more orange than yellow. The taste is tart like a lemon, but slightly sweeter. You can find them in most regular supermarkets or Whole Foods. The only downside is that they are not always available all year long. When you do see them in the produce section pick some up – you will not be sorry! Create a simple syrup by combing 1/4 cup sugar and 1/4 cup water in a small saucepan. Bring to a boil. Stir the sugar until it is totally dissolved and remove from the heat. Allow to cool completely. Juice the meyer lemons and place into a pitcher. Add the vodka, simple syrup, sprig of mint and stir. If you are not serving the martini right away you can allow the drink to chill in the refrigerator. You can also pour it into a martini shaker with some ice and shake until frothy and ice cold right before serving. 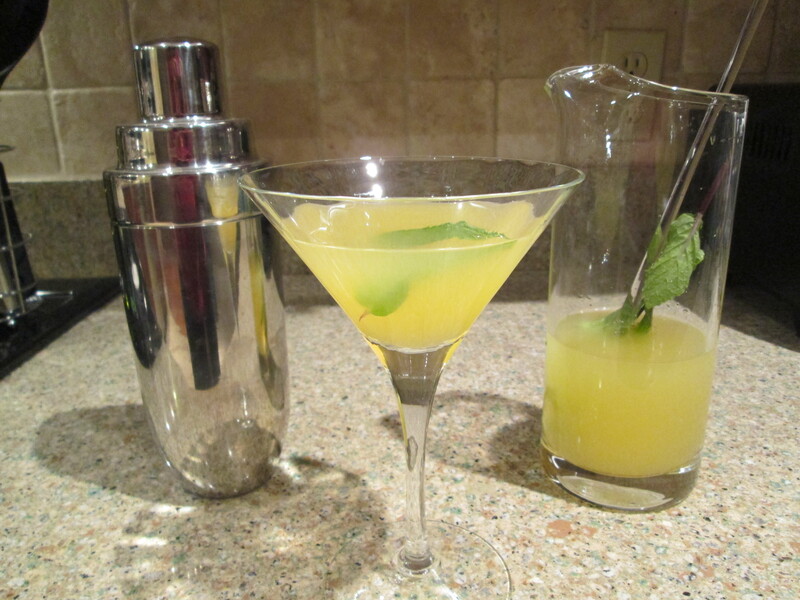 Garnish with a mint leaf. I want to start off by wishing everyone a happy new year! ‘Tis the time for new year’s resolutions. This year I made the same two resolutions that I make every year – to loose weight and to eat healthy. That is why my first posting of the year is a fabulous recipe that can help accomplish both of these goals. This salad is colorful, delicious and good for you too! It has lots of healthy veggies – red pepper (which has more vitamin C than an orange), lettuce, carrots and cucumber. It also has protein with the edamame. 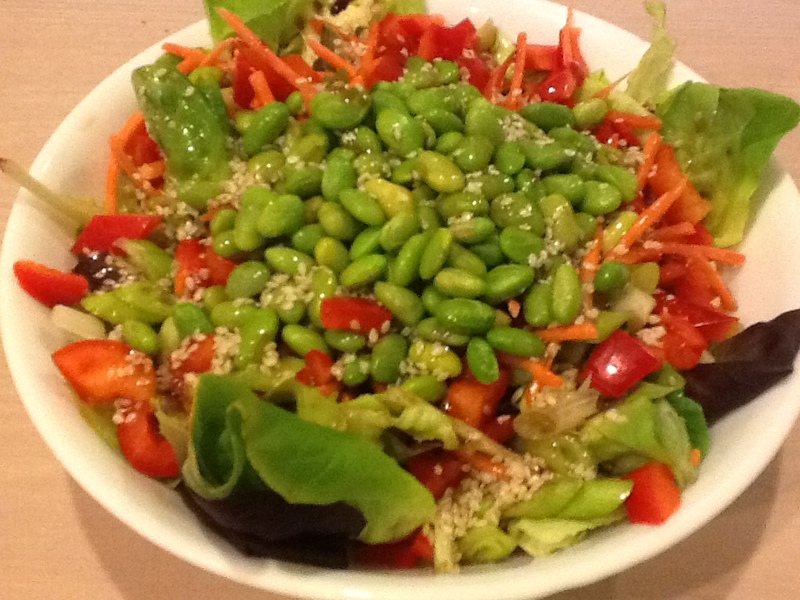 For those of you who are not familiar with edamame you really must try it. I love it steamed or dry roasted as a snack or salad topper. It is low in calories and fat, and provides lean protein as an added bonus. 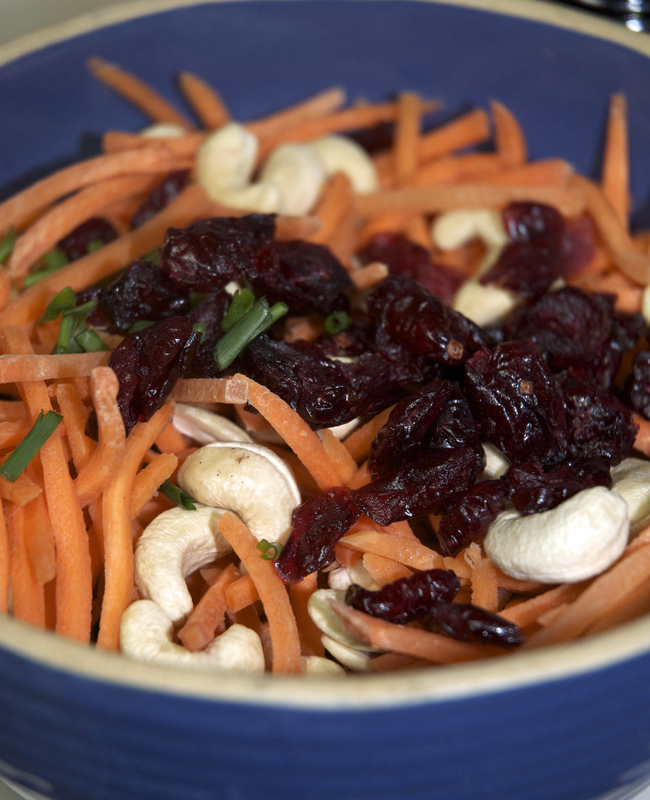 Another great thing about this salad is that it is very easy and quick to prepare. 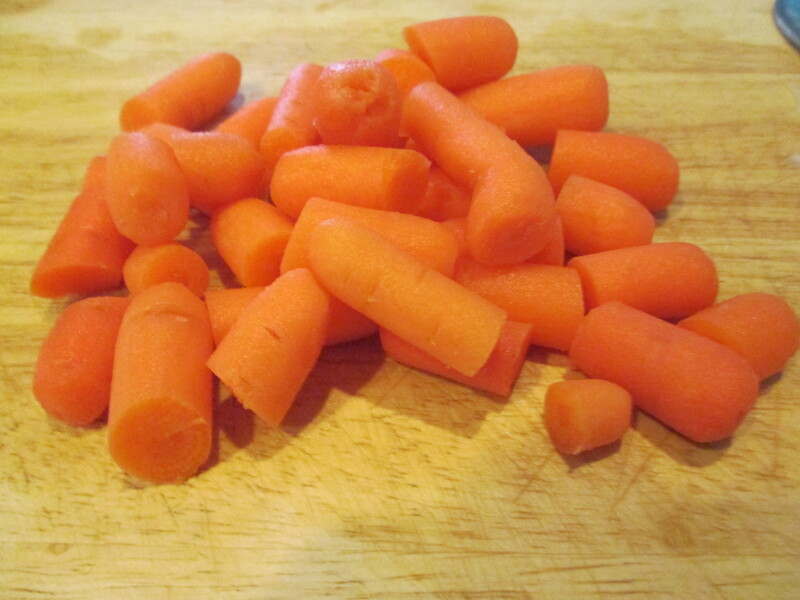 I use pre-washed lettuce as well as pre-shredded carrots to save on time. You just have to do a little chopping, make a quick dressing and voila! A pretty, healthy and delicious salad that is ready in no time. This can be a nice starter salad or even a main course. 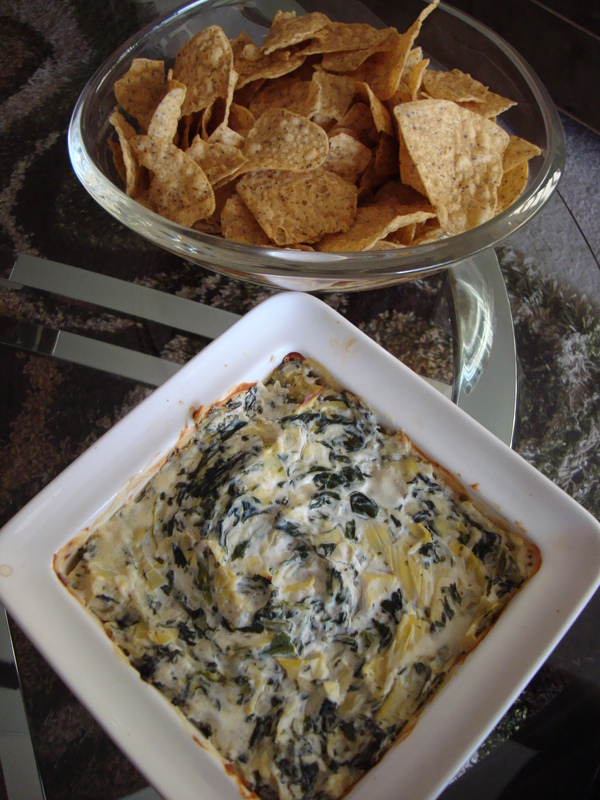 If you are serving it as a main course it would be great with some grilled chicken or salmon. When you are trying to keep a new year’s resolution this is exactly the kind of food that can help you stick to it! Defrost the edamame (I usually defrost in the microwave for 2-3 minutes). 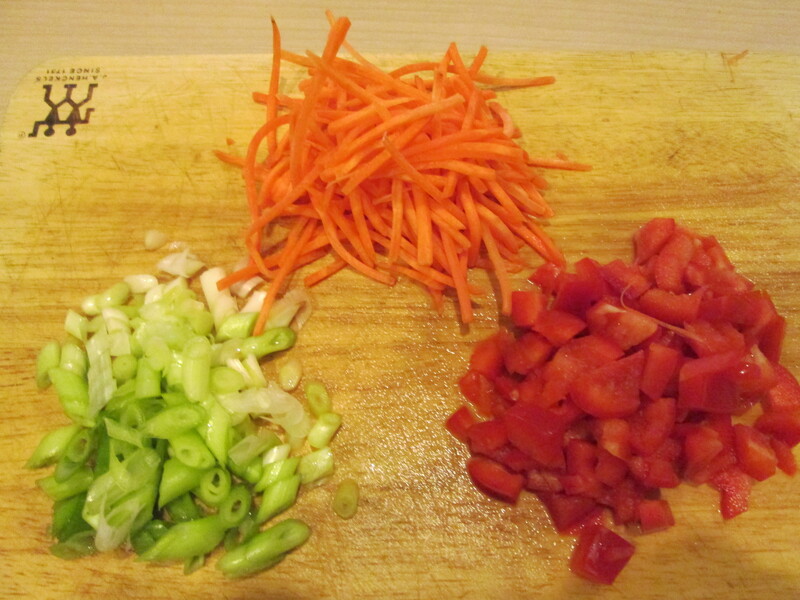 In a large bowl toss the lettuce, carrots, red pepper, cucumber and scallions. 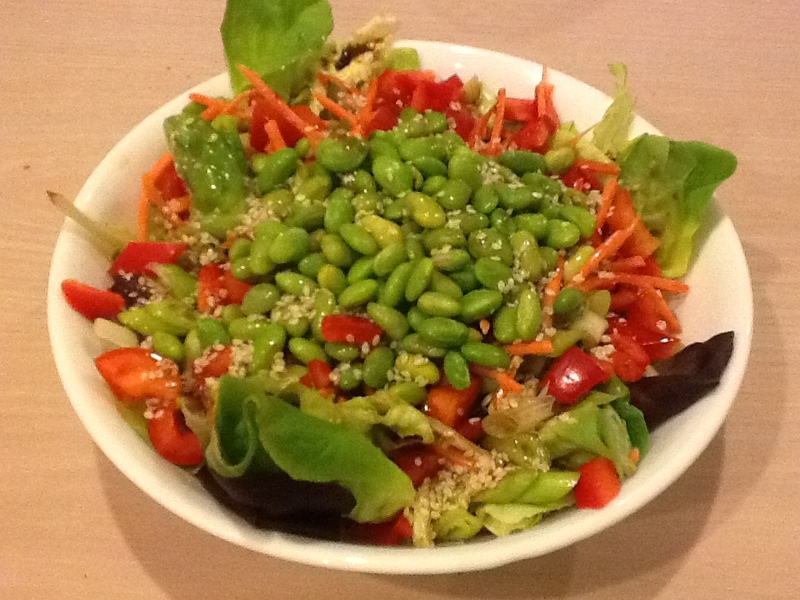 Pile the cooled edamame on top of the salad. 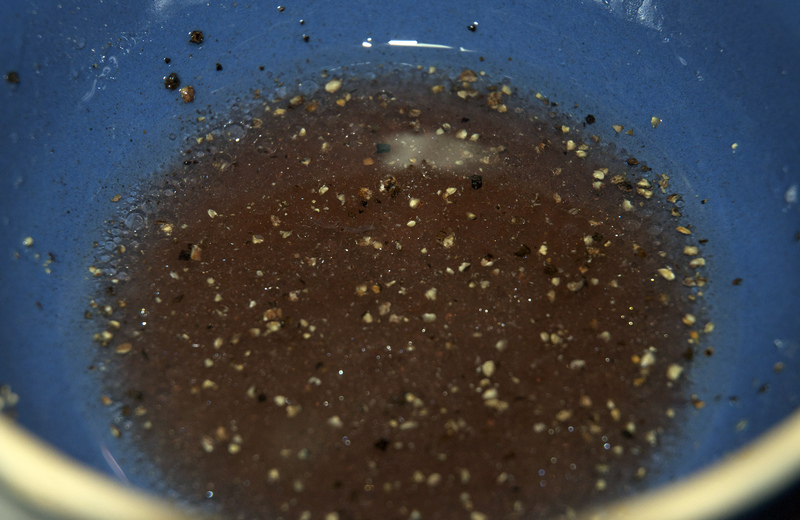 Combine the sugar, rice vinegar and soy sauce in a bowl. Whisk to combine. 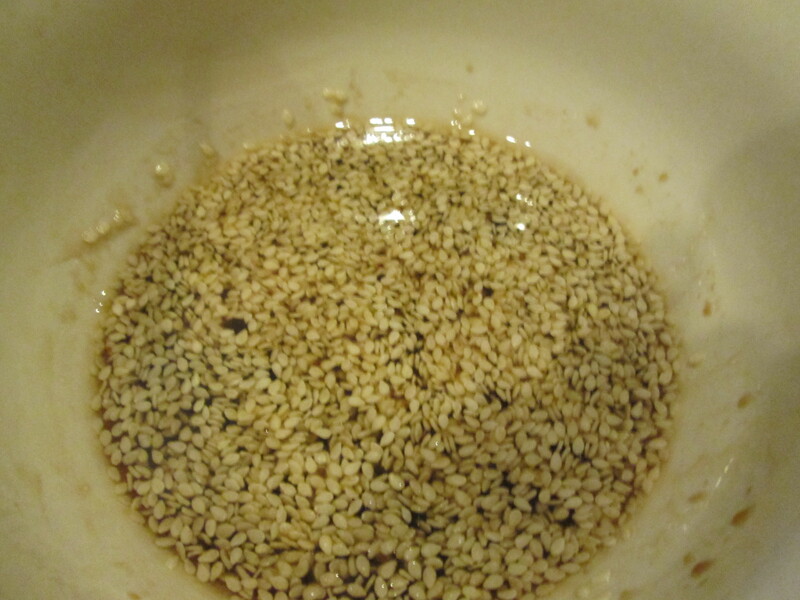 Add the sesame oil and sesame seeds and whisk some more. Slowly stream in the canola oil while whisking vigorously. I did a soup posting last week and I normally would not do another soup recipe so soon. I do have a reason. The kosher link up for this month is “comfort food” (see below!). There are plenty of foods that I consider comfort food – spaghetti and red sauce, macaroni and cheese, mashed potatoes, the list could go on. However, if I was to pick my ultimate favorite comfort food it would be a hot bowl of chicken soup. There is just something about walking in the door to the smell of chicken soup cooking on the stove. It is what makes you feel better when you are sick, when you are cold and when you are down. 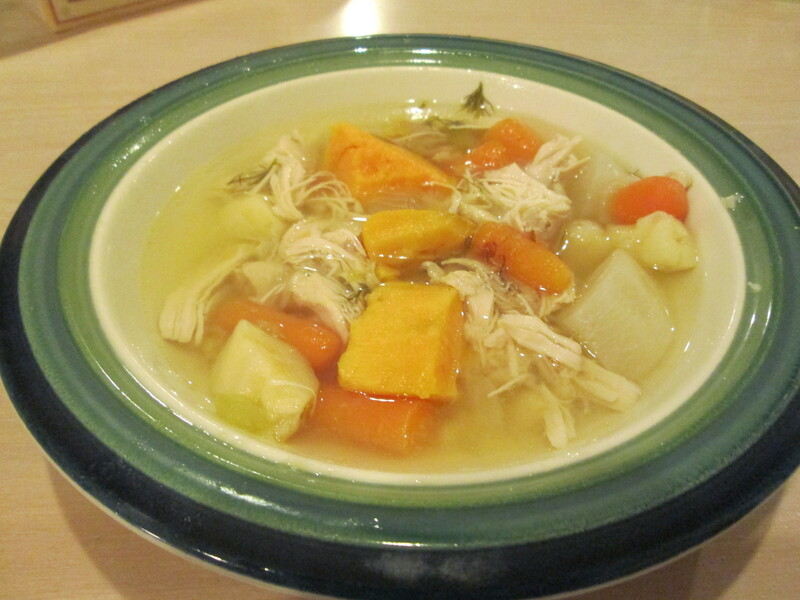 Part of the reason chicken soup is my favorite comfort food is that it reminds me of family. Everyone has at least one grandma with a chicken soup recipe that was probably passed down from her grandmother. 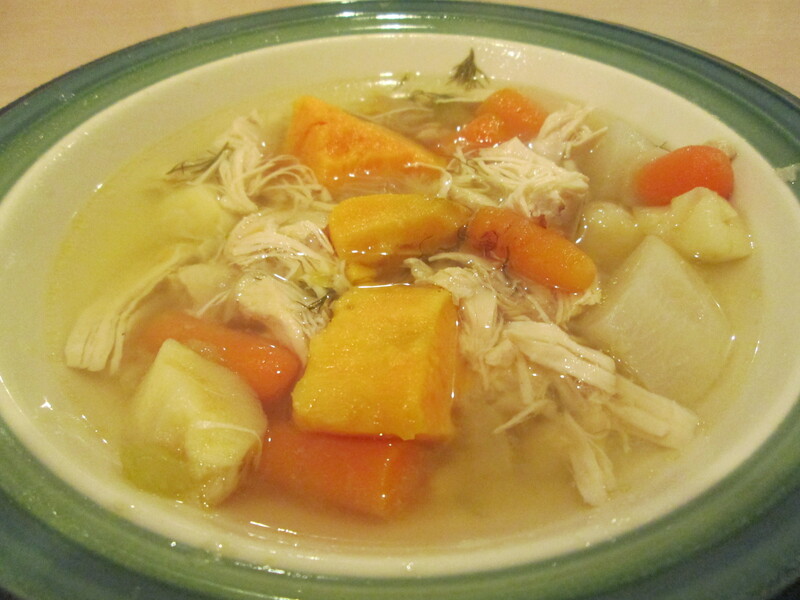 Since I have already posted my family’s chicken soup recipe on this blog I decided to post my husband’s grandmother’s recipe. Unfortunately Grandma Shirley (aka Rue) is no longer with us. I am so lucky that I was able to sit down with her one day in her kitchen and for her to tell me how she makes her chicken soup. I only had it once, but I remember it being delicious. You could taste the love. She never did write it down, or give me exact measurements, so I just experimented and added my own touches until I came up with what I think is a pretty darn good chicken soup. Being that I love chicken soup I am pretty picky when I eat it out or at someone else’s house. 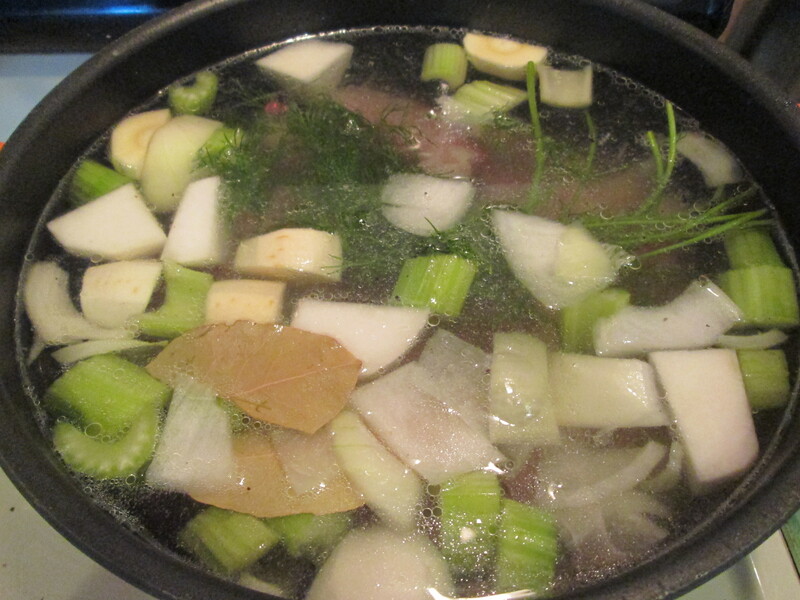 I find that people often go overboard with the dill, or that the soup does not have a lot of flavor. You won’t have that problem with this recipe! It has rich and delicious and perfect. 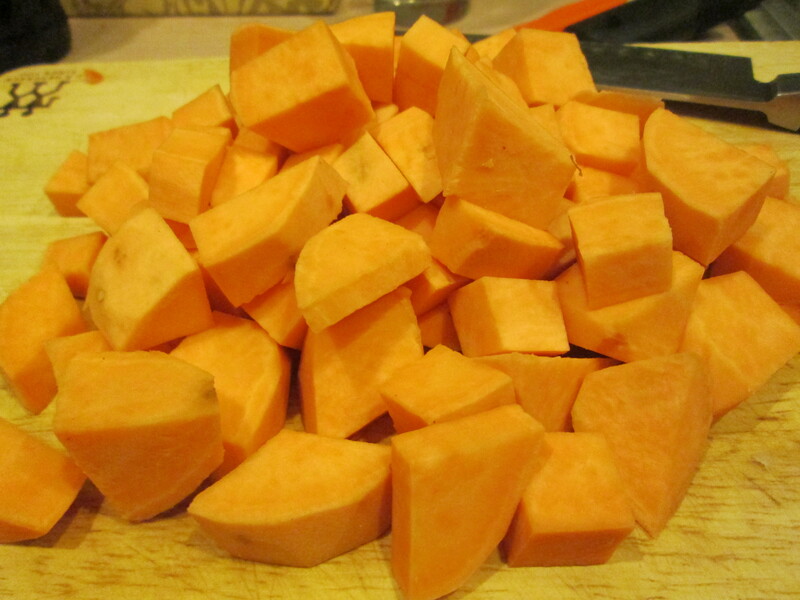 The key ingredient (according to Grandma Shirley) is the sweet potato. 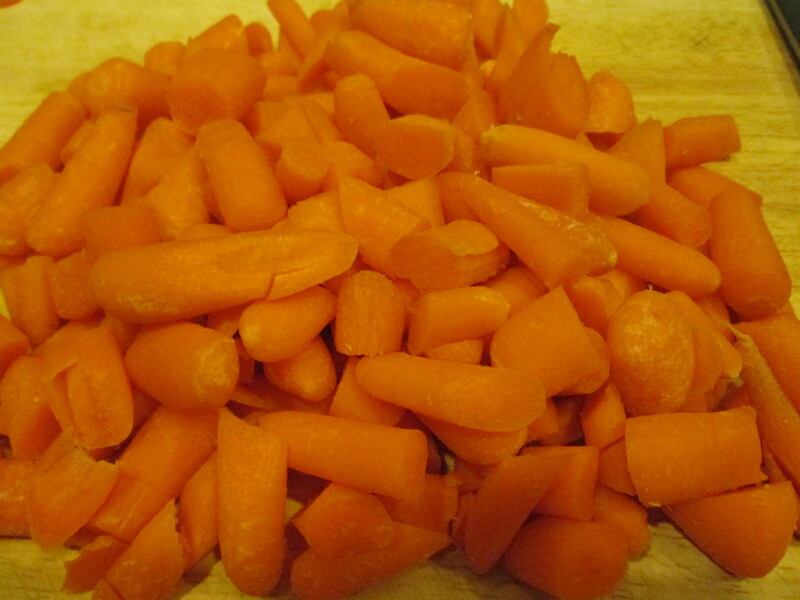 Funny enough, this is the secret ingredient in my carrot ginger soup as well. It adds a sweetness and great color. I have made it without the sweet potato and it is just not the same. You just want to be sure not to put it in until an hour before you serve as it could fall apart. 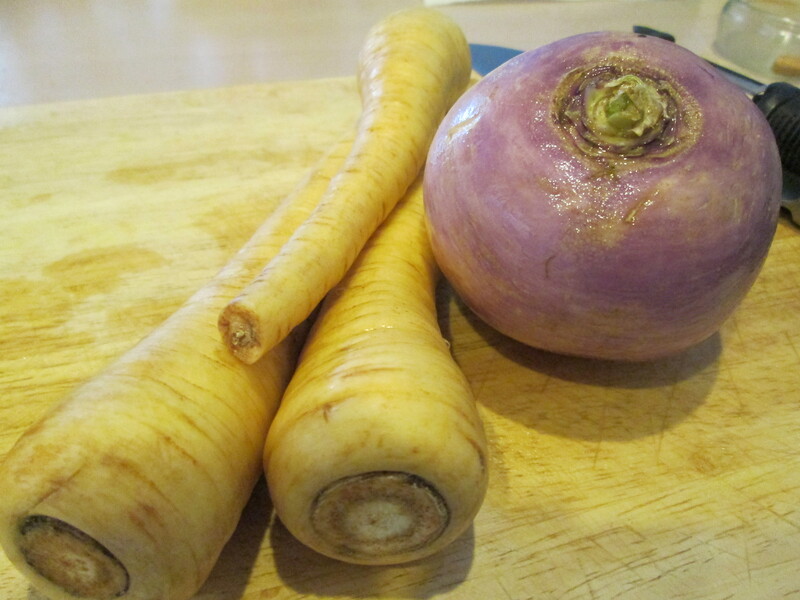 The other 2 ingredients that are key are the parsnip and turnip. I know these are not items you buy every day, but they make a big difference in the flavor of the dish. The soup is very easy to make. You basically just throw everything in a pot, add water and come back to stir every once in a while. The time commitment comes from letting it cook for hours. I say two hours is the minimum, but the longer the better! You can leave it cooking on the stove and get on with whatever else you need to do. I personally like this soup with matzah balls, but it is also great with noodles, rice or just with the vegetables. You can either shred the chicken and add it to each bowl, or leave it out. Leftovers are delish and it also freezes well. Just be sure to serve it HOT. Coat the bottom of a very large soup pot with nonstick cooking spray and heat on medium temperature. Add onion, garlic, carrots, celery, parsnips and turnip. Allow vegetable so soften, about 5-7 minutes, stirring often. Add the chicken pieces and season with salt and pepper. 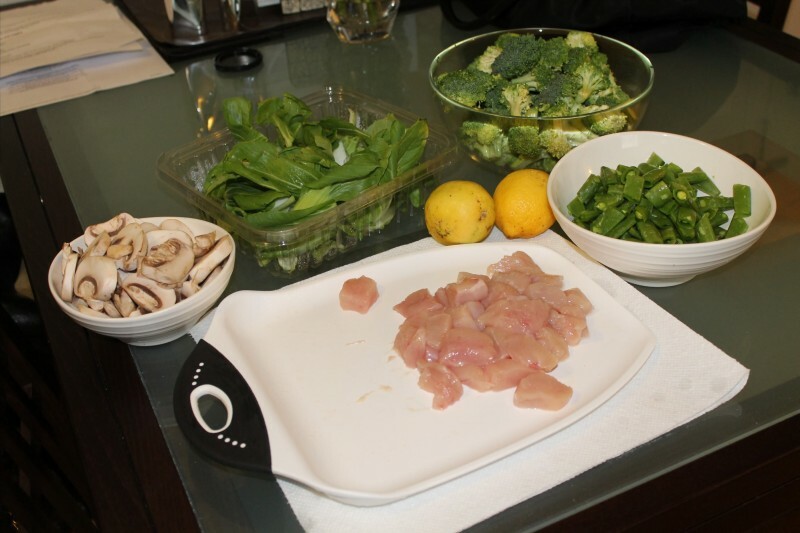 Fill the pot with water until the chicken and vegetables are covered by at least 5 -6 inches. Again add a few pinches of salt and fresh cracked pepper. Tie parsley, thyme and dill together with twine and add to pot along with the bay leaves. Stir well. 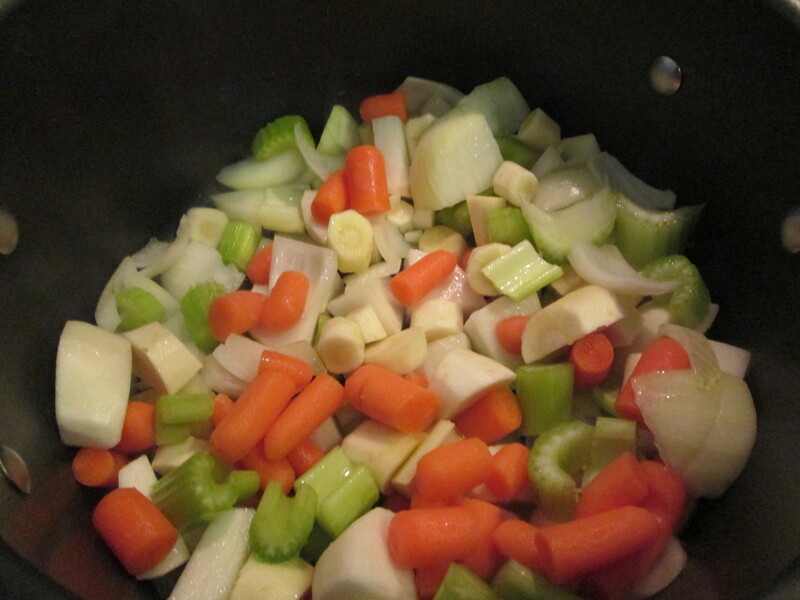 Bring the soup to a boil and reduce the heat to medium-low so that the soup is simmering. Skim the fat and any solids off the top of the soup. Let the soup simmer. Come back every 30 minutes to stir and skim any fat or solids. 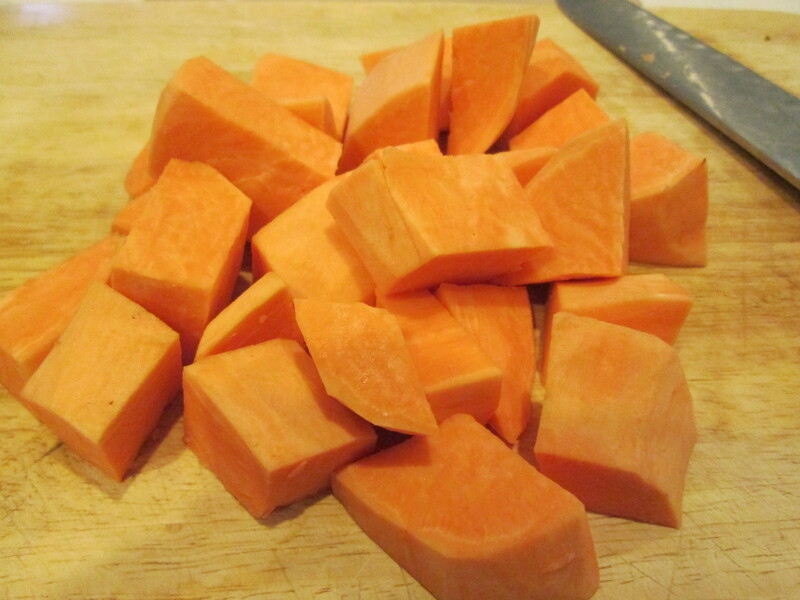 About an hour before you are going to serve the soup add the sweet potato. You do not want to add it in the beginning because it will fall apart in the soup. 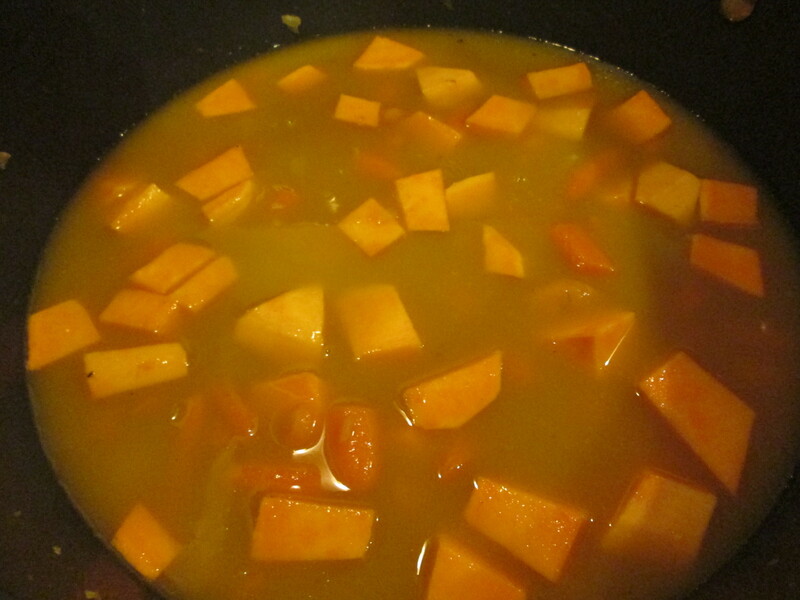 When you add the sweet potato bring the soup to a boil again by raising the heat. After it boils reduce to simmer. Keep it over medium-low heat until you are ready to serve. After long last – a new post! For those of you who regularly follow this blog I must thank you for coming back to the site even though I have not posted in months. It is amazing that I am still getting traffic and that people are telling me to keep posting new recipes. I actually really miss blogging, but my priority these days are taking care of my two little ones and my day job. I have so many recipes that I am dying to put pen to paper, but alas, there are just not enough hours in the day! So, why a new recipe now? I have been making this dish a lot lately. I love soups and the fall/winter time is the perfect time for it. The reason I am finally getting around to writing this recipe up is because my mom is taking it to a “Sweets, Snack and Soup Swap”. Everyone at the party is supposed to bring either a sweet, snack or a soup for every person at the party and then they all get to take home the treats along with the recipes. Cute idea! My mom loves this soup so I told her I would make it for the party. Since she needs the written recipe I figured I might as well post it here. I have been meaning to anyway…. I know I am not the first person to make carrot ginger soup. However, I believe my recipe is unique and one of the best out there (at least I think so!). 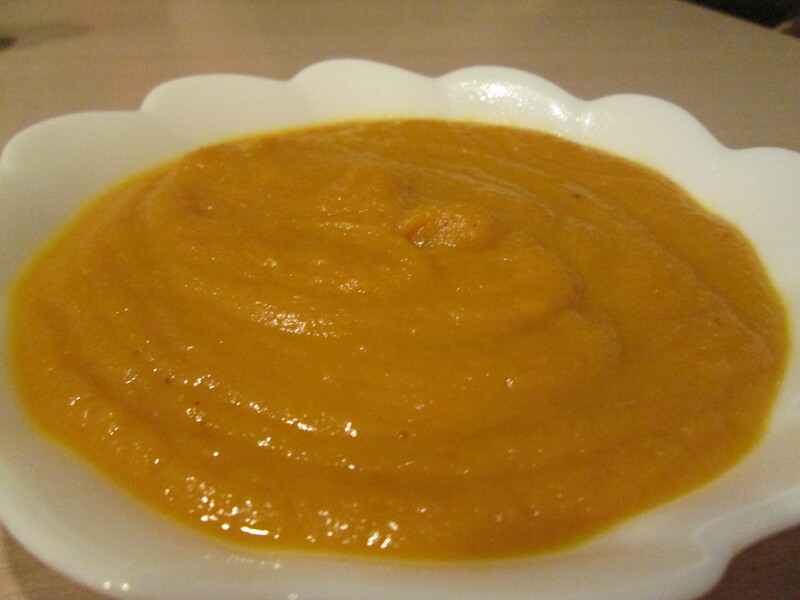 There is a restaurant that I really like, and makes a great carrot ginger soup. One day I had a craving for it, but did not have time to get to the said restaurant, and to be honest the place charges an arm and a leg for a bowl of soup. So, I did what many people do and went to the internet to find a good recipe. I found one that I thought fit my three criteria – it has to be easy, it has to be quick and has to be GOOD. The recipes I found were quick and easy, but not really good. In fact, most were pretty blah. They just seemed to be missing something. So, I started from scratch and came up with my own creation. There are a couple of elements that make my version of this dish easy, quick and GOOD. Using baby carrots is key. They save time on peeling carrots and I also find them to be sweeter. Another big time saver is using already pureed ginger. You can find this in a jar or tube in most grocery stores. Another alternative is to use frozen crushed ginger. Dorot is a brand that I like and can be found in the freezer section of the grocery store. The easiest way to puree the soup is to use one of my favorite kitchen tools, the immersion blender. If you do not have an immersion blender you can use a blender or food processor. I have a few ingredients in this recipe that are not typical to carrot ginger soup, but I think make a big difference. I love the sherry in this soup as it adds a certain warmth. I have made it without, and it is still a delicious soup, but is even better with the sherry. The sweet potato is not traditional in this recipe, but I think it makes a big difference to the texture and layering of flavors. At this point I even like this soup better than the one I had at the restaurant! Another perk is that it is low in fat, high in vitamins (actually good for you!) and pretty filling. 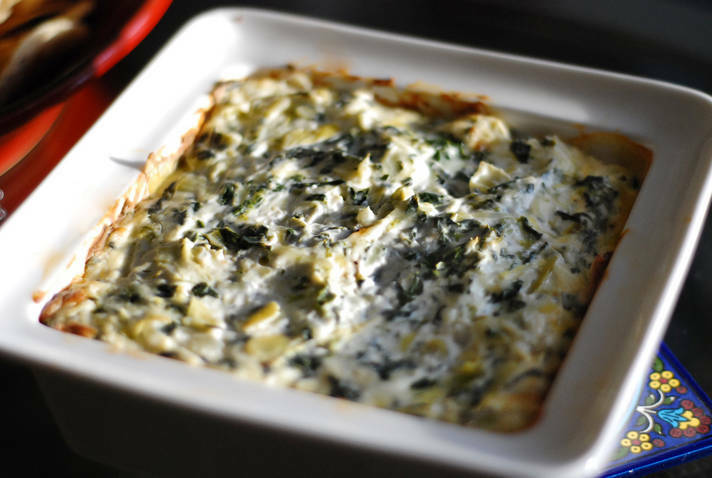 It makes an excellent starter dish or main course with a piece of crusty whole grain bread. I am so happy to finally be able to share this recipe as I have been making it so often. Stay tuned next week as I am planning a new posting so that I can participate in the kosher link up for December – comfort food – yum! Heat the olive oil in a large stock pot over medium heat. 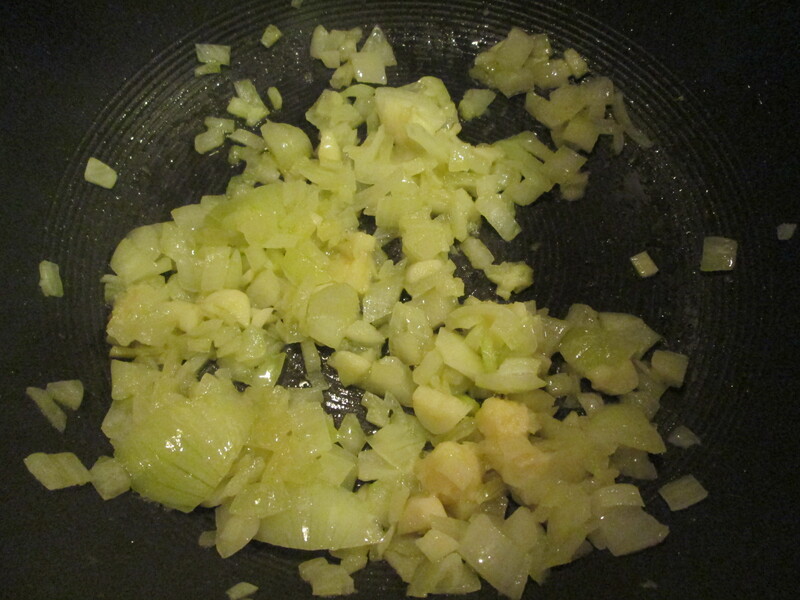 Add the onions and garlic, and cook until they just begin to soften (about 5 minutes) stirring often. Lower the heat if the onions begin sticking to the pot. Add the ginger and sherry and cook for another 5 minutes, stirring often, until the onions are translucent, but not brown. Add the chopped baby carrots and sweet potato, salt and ground black pepper. Cook for 5 minutes, stirring often and then add the vegetable stock. Raise the heat to high and bring to a boil. After the soup has come to a boil, give the soup a good stir, lower the heat to medium and cover the pot. Cook covered for 20 minutes. You want to be sure that the soup is still simmering, but not at a rolling boil. 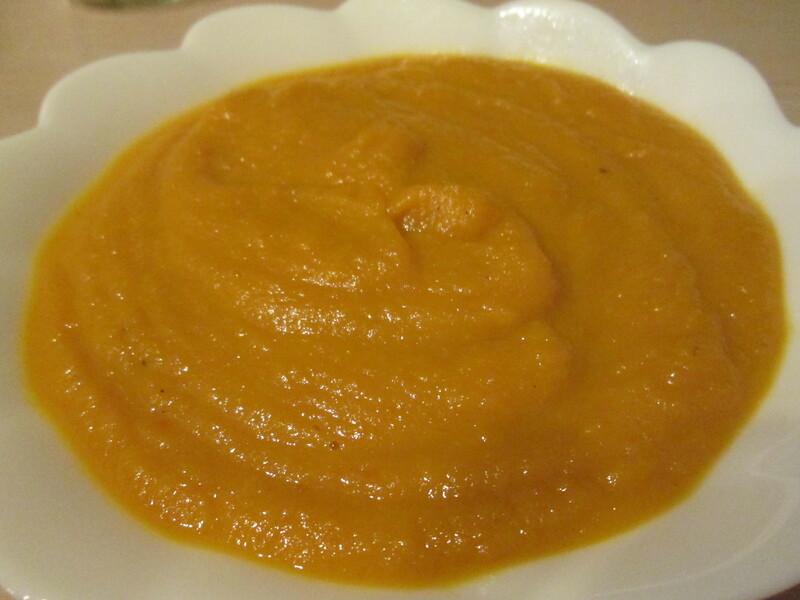 Use an immersion blender to puree the soup until it is a smooth consistency. Serve hot. This post was supposed to be published last week. Unfortunately, it was derailed by my son getting sick. For all you parents out there, I think you will agree that there is nothing more stressful than your child getting sick. You can have stress in your job, your relationship, or any area in your life, but there is nothing as stressful as watching your little one ill. Last week was my son. This week is my 6 month old baby. To say I am at my wits end is an understatement! My original version of this recipe was made with chicken so that is how I always make it. However, you can leave the chicken out for a vegetarian dish. You can also change up the vegetables for whatever looks good, or you happen to really like. Different colored peppers and zucchini are also great in here. With all the veggies, little fat and lean protein this is as healthy as it is tasty. I like to serve this over white or brown rice. Delicious! Put up water for whatever rice you plan to make. Prepare the rice. In a large skillet heat the canola oil over medium heat. 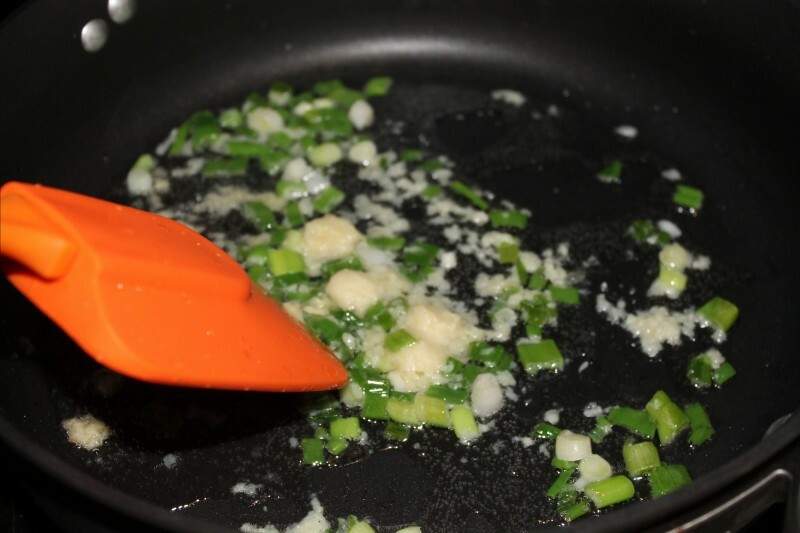 Place the ginger and scallions in the pan and sauté until the scallions just begin to soften, about 2 minutes. Add the lemon juice and soy sauce and stir. 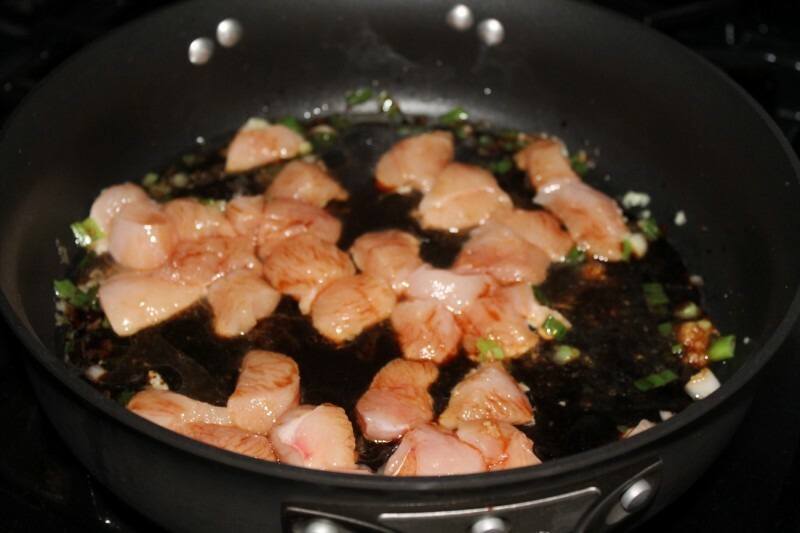 Place the chicken into the pan and let cook for four to five minutes. 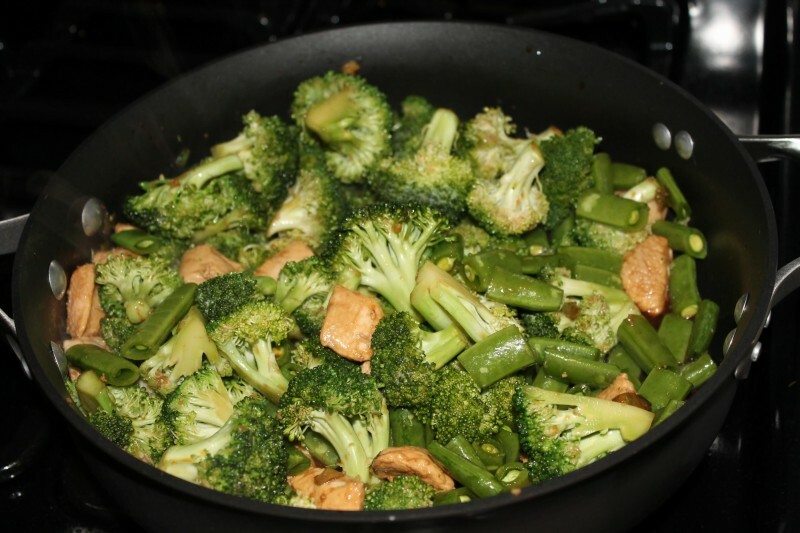 Add the broccoli and let cook for two or three minutes, until it begins to soften. Add the bok choy and stir. Once that softens a bit add the snap peas and mushrooms. 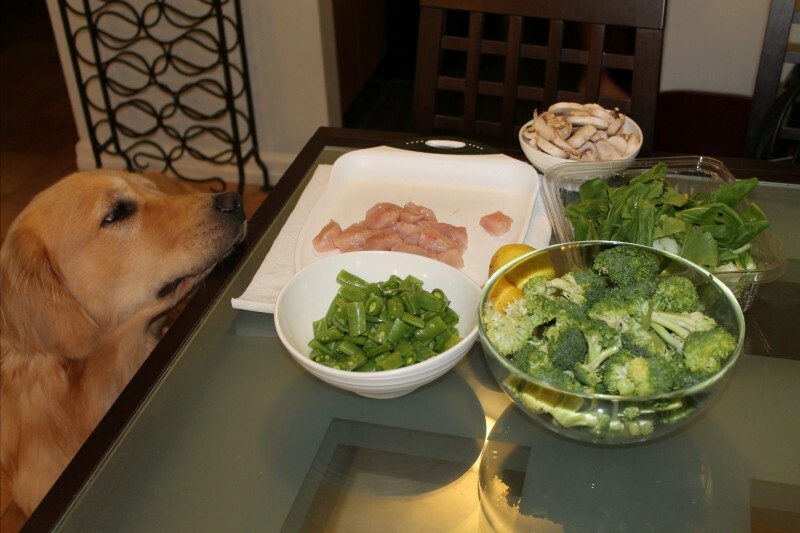 The idea is to add the vegetables in order of which will take the longest to cook. 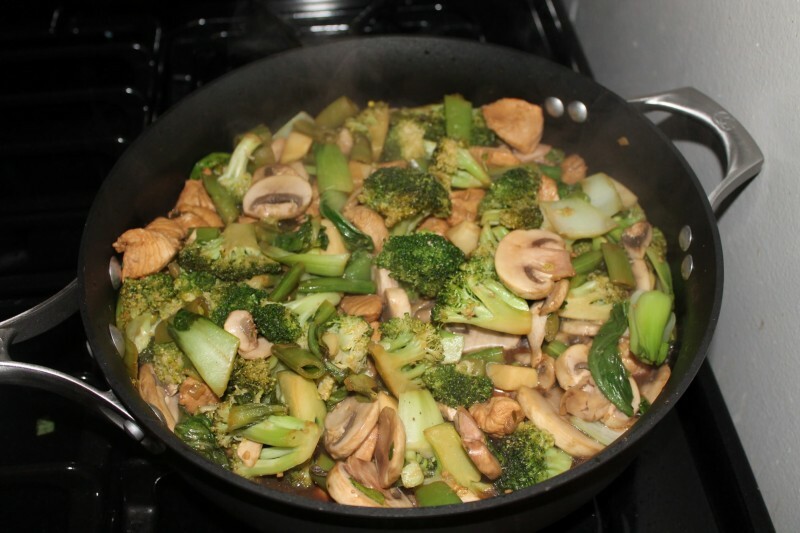 Sauté over medium heat until the chicken is cooked through and the vegetables are tender. 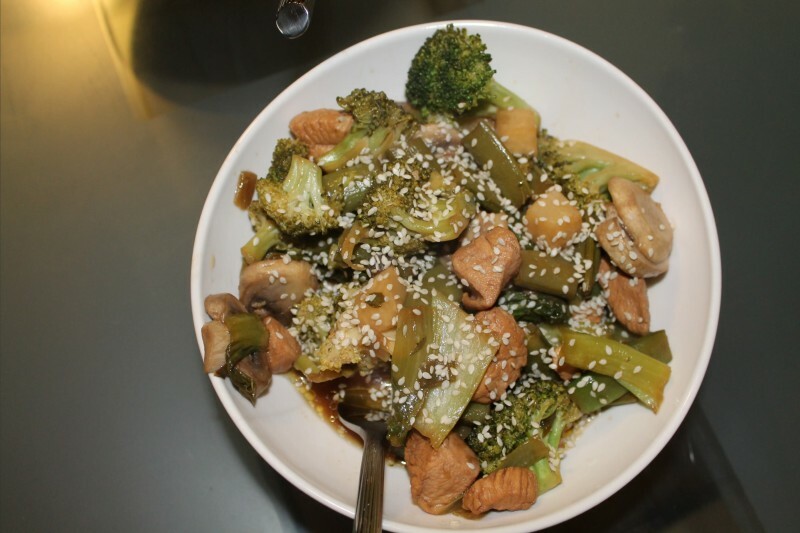 Garnish with sesame seeds and serve over whatever rice you like best. In my previous post I mentioned that I was working on some summer time recipes. This is one of them. When the weather is hot outside I love easy and no-cook recipes. This is a nice dish to take on the go, for a picnic or outside party as it does not have any mayonnaise and can sit out for a while. This recipe came about when I was really wanting salad one night, but was out of lettuce. I did have a bag of grated carrots in the fridge. I started looking through my pantry, putting things into a bowl and Wallah! 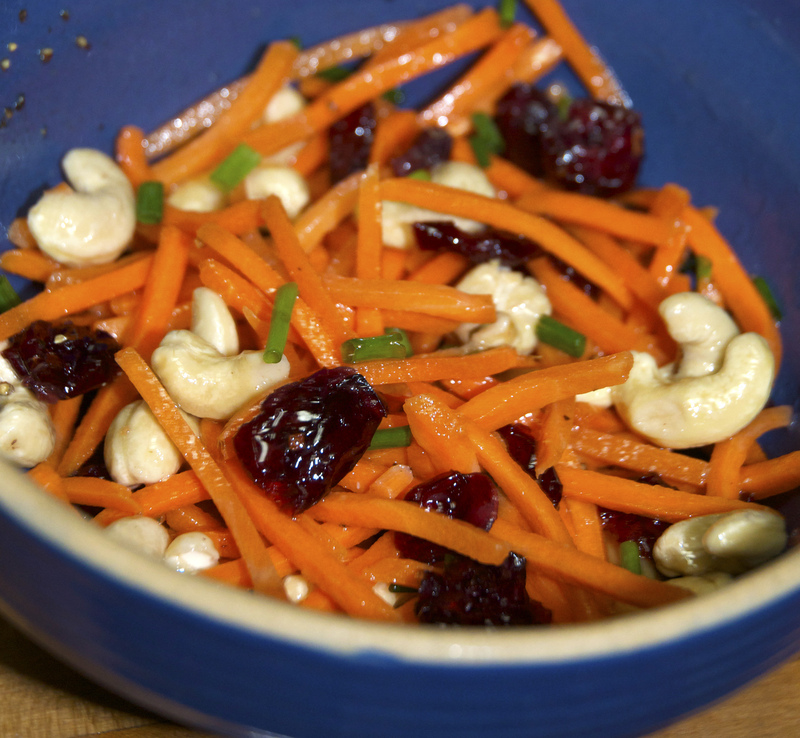 Place the carrots, nuts, cranberries and scallions into a large bowl. Dissolve the honey and salt into the vinegar in a smaller bowl. Add the pepper and whisk in the canola oil. 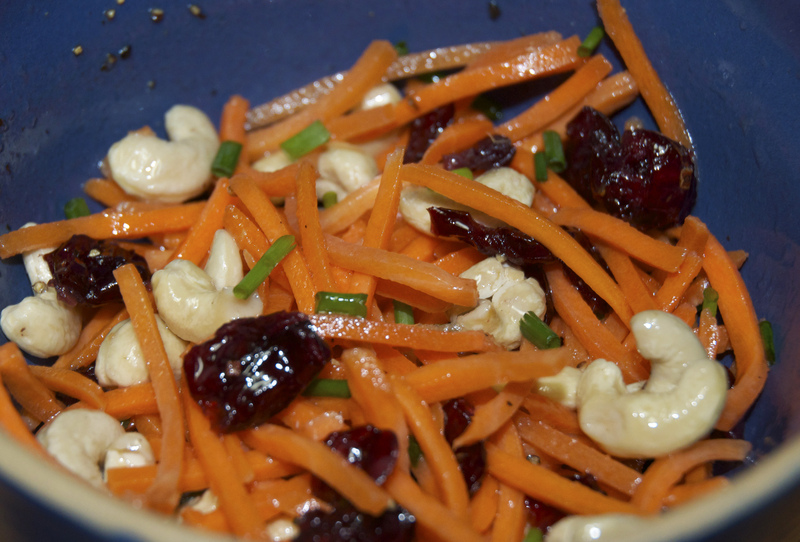 Add the dressing to the carrot mixture and mix well.